Monday, May 3, marked the 169th anniversary of the arrival of the first Portuguese as indentured immigrants in British Guiana. Today we publish an article by Prof M N Menezes, RSM, on the Portuguese and the faith they brought with them. The Madeiran Portuguese first arrived in British Guiana as indentured immigrants on May 3, 1835. Not only did they bring their agricultural expertise but their faith as well. The Madeirans were profoundly religious: their religion - a 'folksy' type of Catholicism which they expressed with joy. They brought new life into the Catholic Church, although during their first ten years and even beyond, they suffered for want of Portuguese-speaking priests. Far away from their island home they longed for the religious practices to which they were accustomed. and on the East Coast, Demerara. Many Portuguese had settled on the East Bank, Demerara, at Meadow Bank, Ruimveldt, and Agricola. It was at Meadow Bank where Bishop Hynes had made the centre of the Catholic Church in British Guiana that the Catholic Mission was handed over to the Jesuits in 1857. The Superior, Fr James Etheridge, SJ, later Bishop, had brought with him two Portuguese-speaking priests, Fr Emiliani and Fr Negri, later joined by Fr Schembri who became known as "the real apostle" of the Portuguese. With the arrival of these priests the Catholic Church advanced rapidly, and what was called the great revival of Catholicism took place. In 1861 Sacred Heart Church, Main Street, was built specifically for the Portuguese, to the great annoyance of the English-speaking Jesuits. Other churches began to rise all over the colony - at Malgretout on the East Bank, Demerara, in Essequibo and all along the East Coast. As the railway extended from Plaisance to Mahaica between the 1840s and 1860s, temporary "church stations" mushroomed along the coast. In 1877 the Church of St John the Baptist, Plaisance, which became one of the leading churches along the East Coast, was opened by Fr Casati who two years later established the boys' orphanage there. 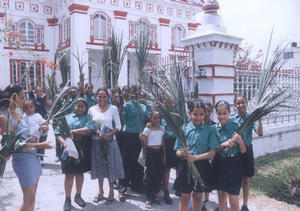 Plaisance became noted for its boisterous festivals. The Madeirans were accustomed to celebrating their religious festas with joyful abandon and with much pomp and splendour. For immigrants settling in a foreign land, the continuation of their tradition through an expression of customs and culture in their own language, enhanced their security and offset their cultural alienation. The feasts of Christmas, Pentecost, of the Mother of God and their favourite saints were celebrated in British Guiana with the same exuberance as they were in Madeira. Of all the religious customs transmitted by the Portuguese, the Christmas Novena continues to hold sway in the hearts of all Catholic Guyanese of every ethnic origin. Another Madeiran custom was the involvement of the men, women and children in confraternities, guilds and societies. Prominent among these societies was the Portuguese Benevolent Society, established in 1872 for the relief of widows, orphans, and for the mutual support of members in sickness, unemployment, old age and imprisonment. The society was also concerned for the education of the children of their members. In general, the Portuguese were concerned for the preservation of their language. Throughout the nineteenth century the majority of Portuguese continued to speak the language among themselves; their songs, their drama recitals were all rendered in Portuguese. There were also a number of Portuguese newspapers, O Voz Portuguez, A Uniao Portugueze, Chronica Semanal, O Lusitano, The Watchman and The Liberal, among others. Not only did these newspapers keep the Portuguese au courant with the business of the day, but they also kept them in touch with events in Madeira and Portugal. Thus the Portuguese needed to maintain their language. Much to the chagrin of the English Jesuits they were not encouraged to go to the already established Catholic schools. Fr Schembri, on the other hand, feared that the Portuguese children would not only lose their language in English-speaking schools but their faith as well. Thus, there were established Portuguese schools for boys and girls. These schools taught other subjects as well as Portuguese - piano, dancing, reading, writing, arithmetic and craft work. In 1890 the Portuguese College, giving a classical type of education, was established, Bishop Butler agreeing with the view that, "To bring up children in their own language was best." Those arguing for Portuguese schools were of the wealthier class who pointed out that ignorance of the English language had not been a deterrent to their economic success. Through the nineteenth century the Catholic Church was closely identified with its Portuguese congregation. The building of the churches in the villages had been mostly financed and supported by the Portuguese. They could well afford it as by the 1880s they "owned the bulk of the property of the Colony outside the Sugar Plantations." They also collected and paid the excise revenue amounting to $600,000 annually. In nineteenth-century British Guiana the rise of the Portuguese to economic prominence was notable indeed. They were prominent in both business and Church affairs, and there is much evidence to prove that they contributed to the support of the Church both back in Madeira and in their adopted land. In other respects the Portuguese culture began to wane. The movement away from the language had begun, and although a number of wealthy Portuguese continued to re-turn to Madeira on a visit to relatives or to see their ancestral home for the first time, the trend was to send their sons to Britain for further education in the professions. Returning doctors and lawyers brought back their skills and the Anglo-Saxon culture as well, which influenced home and church. By the early part of the twentieth century Church celebrations had begun to lose their early exuberance. This was a result not only of the new breed of Portuguese and of priests, but of the burgeoning cosmopolitan nature of the Catholic Church embracing other ethnic groups through example and the influence of the schools. Much of the religious legacy, however, lived on and was passed on - in the Christmas novena, in the guilds, confraternities and societies which continued to make an impact on Catholic life. There is no doubt that the growth and expansion of the Catholic Church in British Guiana owed much to the Madeiran emigrants who brought to the colony not only their agricultural and commercial expertise, but their deep and joyful faith.